Whatsapp one of the most used messaging app in the world and although we use it everyday we may not be aware of all the features that it provides. We already know the two blue tick marks means message has been read by the receivers. But do you know there is a way of finding it out if a particular user has read your message that you have sent to a group. 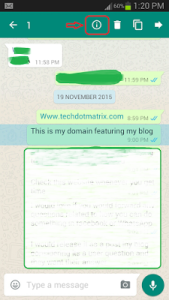 Don’t Miss: How to delete WhatsApp Account permanently? Because, at times, we want to know if group message has been read by all or not, in case we need a response from a particular individual in that group and want to make sure that the message has been read by that particular user or not. Here is the little trick to find it out. Step 1: Launch WhatsApp and tap on any group. Step 2: Tap and hold on the sent message, a menu will popup then tap on Info. Step 3: Now, you will see who has read your message under Read By. Step 4: Those who haven’t read your message as yet will be listed under Delivered To. The different icon which represents the status of message are as follows. 1) Clock Icon: Message is being sent. 2) One grey check mark: WhatsApp Message sent successfully but not delivered. 3) Two grey check marks: WhatsApp Message successfully delivered. 4) Two blue check marks: when the message is read. 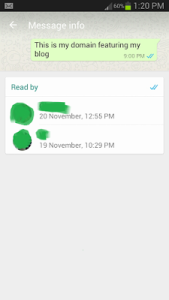 NOTE: There is another feature in WhatsApp which let user to keep their privacy by enabling a feature which allows user to stop showing their read receipt to anyone. In that case you would not know if an individual user has read it or not. 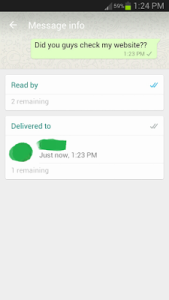 I will show the steps for stopping the read receipt option in WhatsApp. Stay tuned…. For more tutorials, visit our TUTEZONE section.